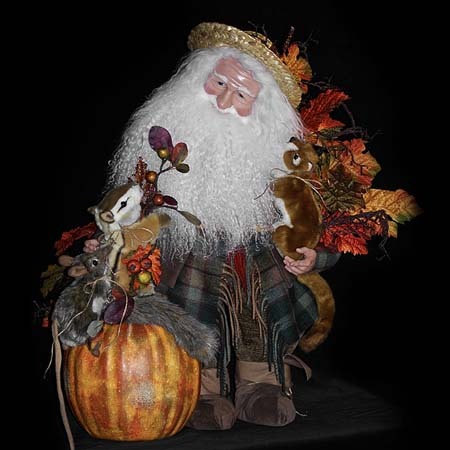 Glad Tidings Santa is sure to delight any Santa collector. 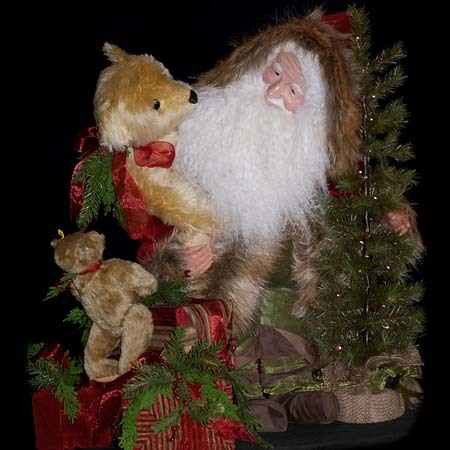 This hand crafted 26-inch Santa figure is dressed in a rich bright red velvet coat, with luxurious, soft, white faux fur trim. He has a gentle and happy hand sculpted face, made with polymer clay. 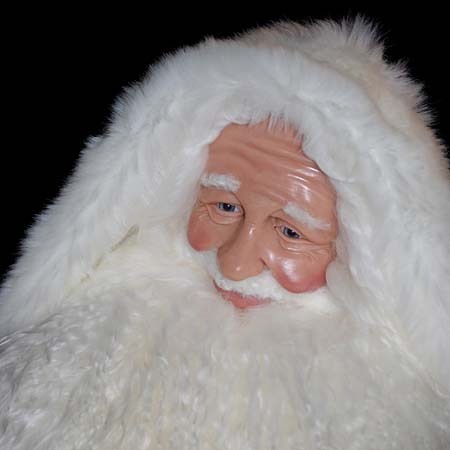 Glad Tidings is signed and dated under his soft white Tibetan wool beard, which makes him a true Santa Claus collectible. Beside him is a large brown suede bag, overflowing with beautiful fabric and organza ribbon wrapped packages, silk pine and cedar branches. 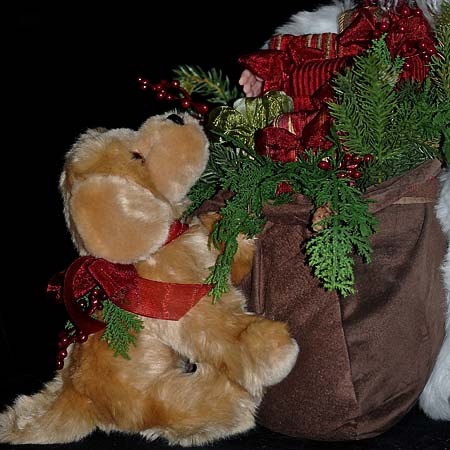 A Golden Retriever puppy is sitting by the bag of gifts, looking up at Glad Tidings, just hoping that one of those gifts is for him. 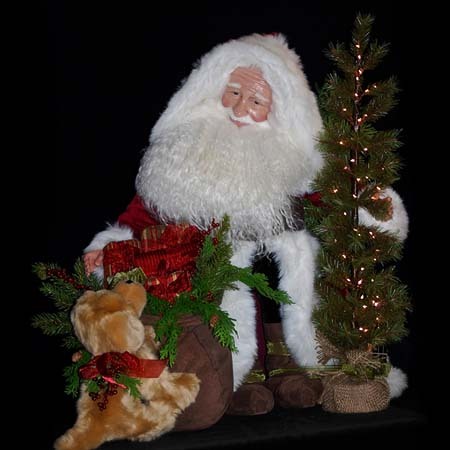 This beautiful Traditional Santa also has a 26-inch pencil pine tree beside him that easily lights up the entire setting. 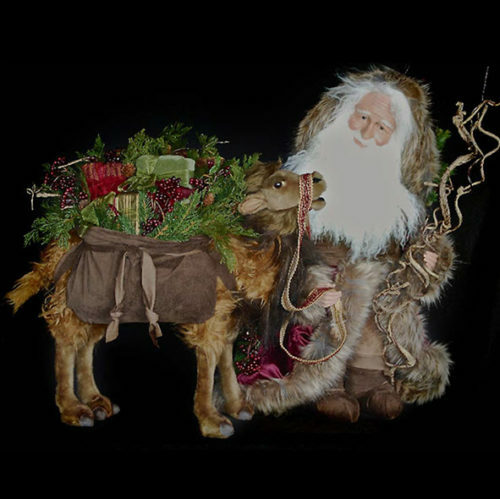 Like all Stone Soup Santas, Glad Tidings stands without help from a doll stand. His body is solidly made with wood and steel. He will make a wonderful addition to your Christmas season collection.